London – 20th October 2016. 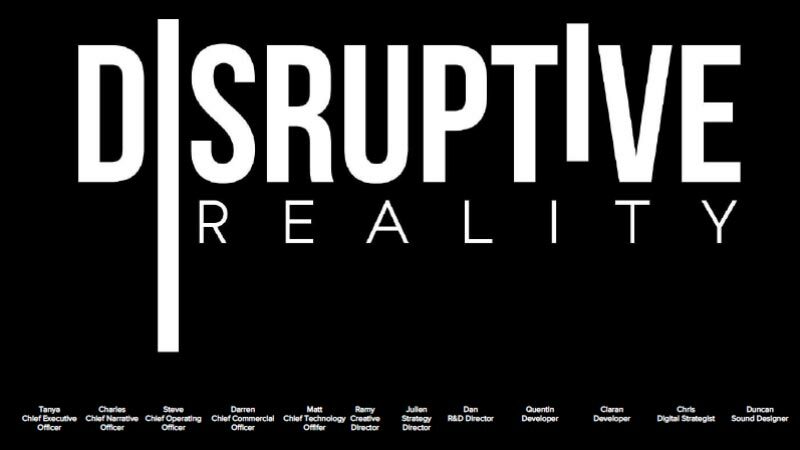 Launched today, Disruptive Reality is a new studio combining the industry expertise of five member companies Digital Jam Ltd, Revolution Software, Amplified Robot/Medical Realities, Spearhead Interactive and Augusto, are focused on launching a new category within VR - Immersive entertainment. Disruptive Reality will work with brands across multiple industries to unlock the value of VR within the wider franchise mix. Immersive entertainment will enable these brands, studios, production houses and more, to create entirely new and unique lines of revenue through the use of virtual reality and immersive technologies. A fast-growing technology that is yet untapped by the majority. The Disruptive Reality Coalition Directors include industry veterans Tanya Laird CEO of Digital Jam, winner of a Women in Games Award 2016 and Vice Chair of BAME in Game; Charles Cecil MBE, CEO of Revolution Software, creators of the Broken Sword franchise; Steve Dann, CEO of Amplified Robot, co-founder of Medical Realities and President of the London chapter of the VRAR Association; Dan Riley, CEO of Spearhead Interactive and Leon Kirkbeck , Managing Director of Augusto. Tanya Laird, CEO of Disruptive Reality and Founder of Digital Jam Ltd, said: "By bringing together cross industry immersive technology expertise we have been able to create an entirely new line of revenue for existing franchises or new Intellectual Property that clearly demonstrates the commercial value of VR and immersive formats as a new line of business within existing monetisation models." "This could mean anything from creating live action 360 movies that allow a user to feel like they are participating rather than observing, through to escaping from a horror movie in real life thanks to Immersive Theatre techniques. The virtual reality industry is still emerging and ripe for new innovative formats - ones we intend to explore at Disruptive reality." Disruptive Reality has already partnered with the world’s largest eSports company ESL UK, MediaCityUK’s innovation hub, The Landing, and dock10, Europe’s leading studio, post and VFX facilities. James Dean, Co-Managing Director at ESL UK said "We’re very excited to be working closely with Disruptive Realities at the forefront of immersive technology collaborating to develop new experiences within eSports.The digital nature of the eSports content we produce and the demographic watching provide a perfect foundation for the adoption of immersive technologies." Jon Corner, CEO at The Landing, a digital enterprise hub at the heart of MediaCityUK where SMEs work alongside large media and tech firms, said "At MediacityUK we have fantastic interconnections with companies driving different aspects of the VR and AR technology jigsaw. But I see our Disruptive Reality partnership as a way of opening doors for new ideas and types of content to be explored by emerging talent. The facilities here at The Landing will enable that talent to access technology and the expertise of the Disruptive Reality coalition. It’s a unique partnership for the UK and I’m delighted to be joining the coalition." Richard Wormwell Head of 360 Production dock10: "360 VR and AR is on the brink of becoming the most exciting new technology development in a generation and through partnering with Disruptive Reality we plan to develop streamlined workflow and production techniques to deliver to this rapidly evolving business and place Manchester firmly on the map of the VR Community"
Disruptive Reality is currently focused on creating revenue opportunities for new and existing franchises and brands with an interest in exploiting VR/AR technology. The company is eager to meet with brands keen to work in this untapped space.